A general view of damaged buildings wrecked by an Israeli airstrike, in Damascus, Syria. Israeli warplanes carried out two airstrikes Sunday near Damascus, one near the city's international airport and a second outside a town close to the Lebanese border. DAMASCUS, SYRIA (ASSOCIATED PRESS) — Israeli warplanes bombed two areas near Damascus on Sunday, striking near the city's international airport as well as outside a town close to the Lebanese border, the Syrian military said. Since Syria's conflict began in March 2011, Israel has carried out several airstrikes in Syria that have targeted sophisticated weapons systems, including Russian-made anti-aircraft missiles and Iranian-made missiles, believed to be destined for Israel's arch foe — the Lebanese Hezbollah militant group. Israel has never confirmed the strikes, and on Sunday the Israeli military said it does not comment on "foreign reports." The Syrian armed forces' general command said Sunday's "flagrant attack" caused material damage, but did not provide any details on what was hit near the airport or in the town of Dimas, which is northwest of Damascus along the main highway from the capital to the Lebanese frontier. "This aggression demonstrates Israel's direct involvement in supporting terrorism in Syria along with well-known regional and Western countries to raise the morale of terrorist groups, mainly the Nusra Front," the military said in a statement carried by SANA. There is no evidence Israel has provided any support to the Nusra Front, which is al-Qaida's affiliate in Syria. 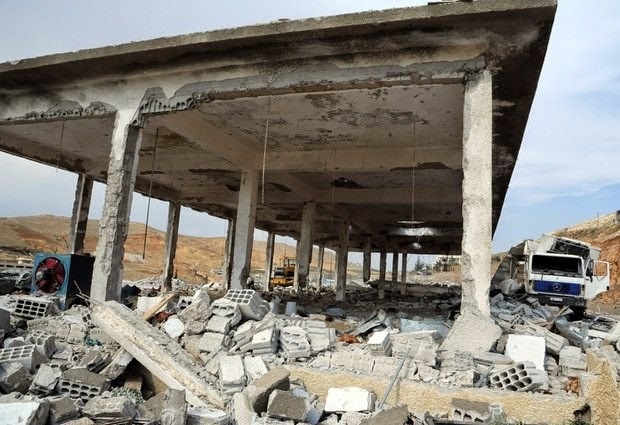 The Syrian Observatory for Human Rights, a Britain-based group that monitors the country's civil war through a network of activists on the ground, said the strike near the Damascus airport hit a warehouse for imports and exports, although it was unclear what was in the building. The Observatory also said that around 10 explosions could be heard outside a military area near Dimas. It had no word on casualties in either strike. While Israel has tried to stay out of the war in neighboring Syria, Prime Minister Benjamin Netanyahu has repeatedly threatened to take military action to prevent Syria from transferring sophisticated weapons to its ally Hezbollah. Israel and Hezbollah are bitter enemies and fought an intense monthlong war in 2006. In May 2013, a series of Israeli airstrikes near Damascus targeted what Israeli officials said were shipments of Iranian-made Fateh-110 missiles bound for Hezbollah. In eastern Syria on Sunday, Syrian warplanes carried out at least 11 airstrikes of their own against Islamic State militants attacking a key military air base, activists said. The Local Coordination Committees activist collective and the Observatory said the strikes targeted four areas near the base. After IS fighters succeeded in storming part of the base on Saturday, the Syrian military launched a counterattack — bolstered by heavy air raids — that managed to push the militants back. Scattered clashes on the ground continued Sunday with fighting on several fronts around the base, activists said. A Syrian military official in Damascus told The Associated Press that troops are in full control of the base. "They (IS) tried to launch attacks from their positions around the airport but they were countered, and tens of them were killed and large amounts of weapons were seized," he said, speaking on condition of anonymity because he was not authorized to brief the media.